Head to these terraces, towers and rooftops for next-level views of the DC skyline. While the nation’s capital has no shortage of great rooftop bars and restaurants, it also includes some especially iconic cityscapes with marble landmarks and sweeping National Mall vistas. While the Washington Monument gets some modern upgrades for its elevator, visitors can still get a bird’s-eye view of the DC skyline at these high-above-the-city hot spots. 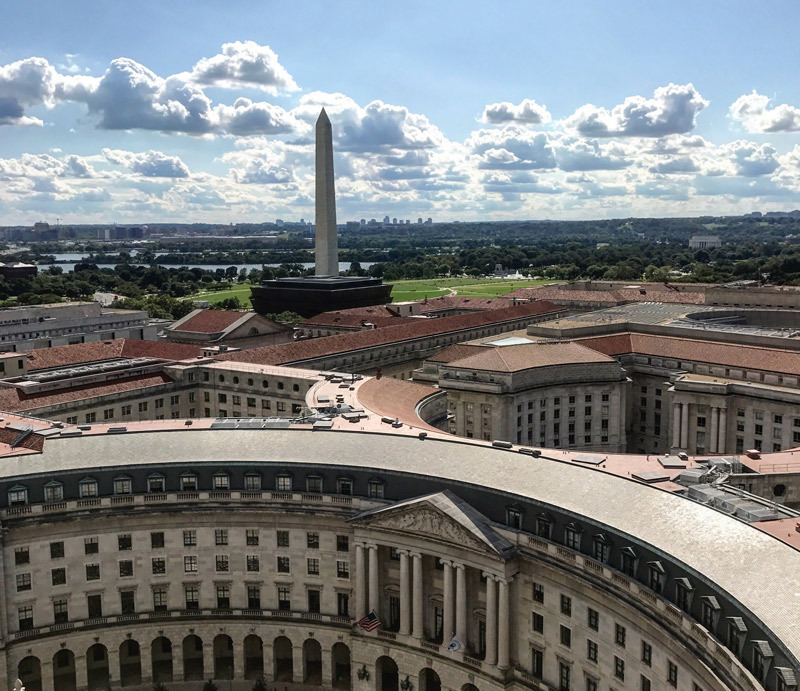 Situated on Pennsylvania Avenue, also known as “America’s Main Street,” the recently reopened Old Post Office clock tower features an observation deck with sweeping views of every direction of the city. Marvel at one-of-a-kind scenes of the U.S. Capitol building, and then admire panoramas of the National Mall. Not only are the cityscapes plentiful, but the clock tower also features the Bells of Congress – ten 300- to 3,000-pound bells which replicate the ones tolling at Westminster Abbey. Situated in the Trump International Hotel Washington, D.C., the tower is operated by the National Park Service. The John F. Kennedy Center for the Performing Arts is a world-class venue with a year-round calendar of theater, music and dance. But even if you don’t have tickets to a performance, it’s worthy of a visit. The wrap-around outdoor terrace is open to the public and offers views of the Washington Monument, Jefferson Memorial and the historic Watergate Hotel. 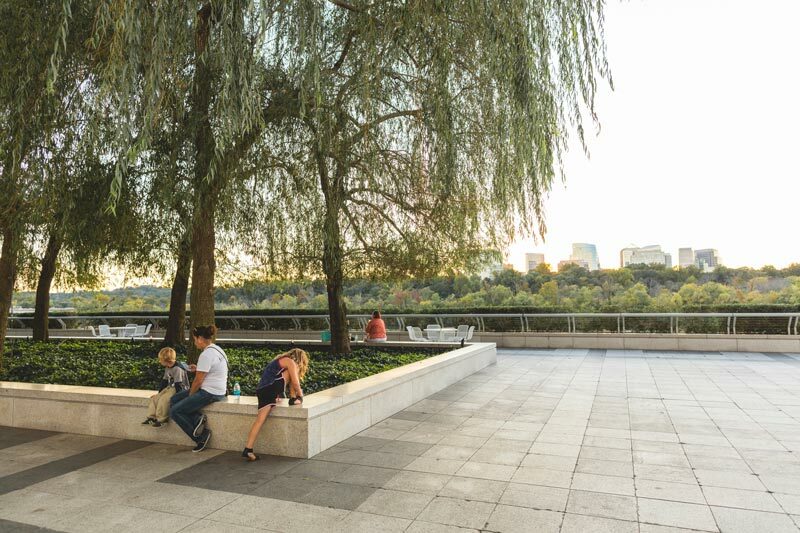 You can also soak in the views from the Kennedy Center’s Roof Terrace Restaurant, which takes pre-performance reservations and hosts a bountiful Sunday brunch. This new observation deck just across the Potomac River in Arlington, Va. offers unparalleled 360-degree views of the nation’s capital. 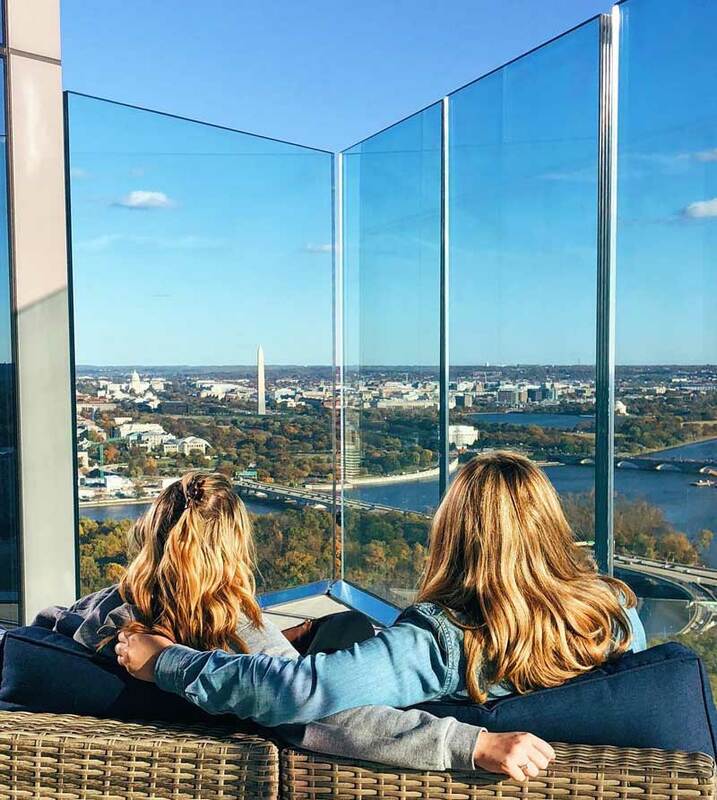 Situated on the 31st floor of the tallest commercial building in the Beltway, enjoy unobstructed views of the National Mall, Georgetown, Arlington National Cemetery and so much more. And while you’re there, be sure to pair your views with a local beer and a bite from the cafe. We recommend you purchase tickets in advance. The Watergate is well-known for its Nixon-era scandal, but The Watergate Hotel recently reopened after a multi-million dollar renovation, which included the unveiling of Top of the Gate. The rooftop restaurant and bar boasts 360-degree views of Washington, DC and Virginia. 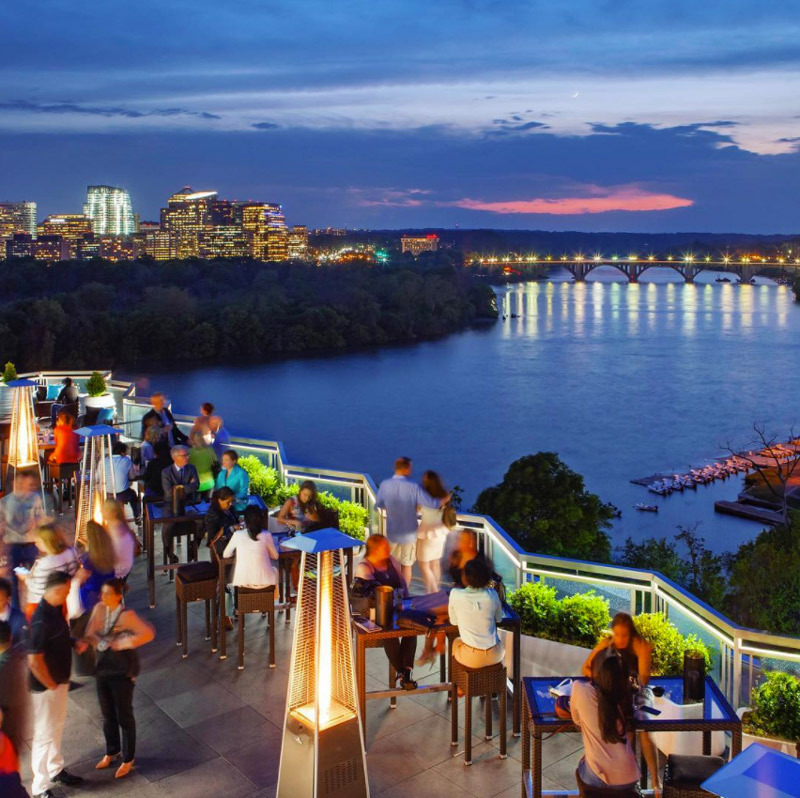 Grab a cocktail and toast to one of DC’s best views. The gorgeous architecture of the Washington National Cathedral is reason enough to head way up Wisconsin Avenue. Daily self-guided tours showcase the cathedral’s history and intricate architectural details. 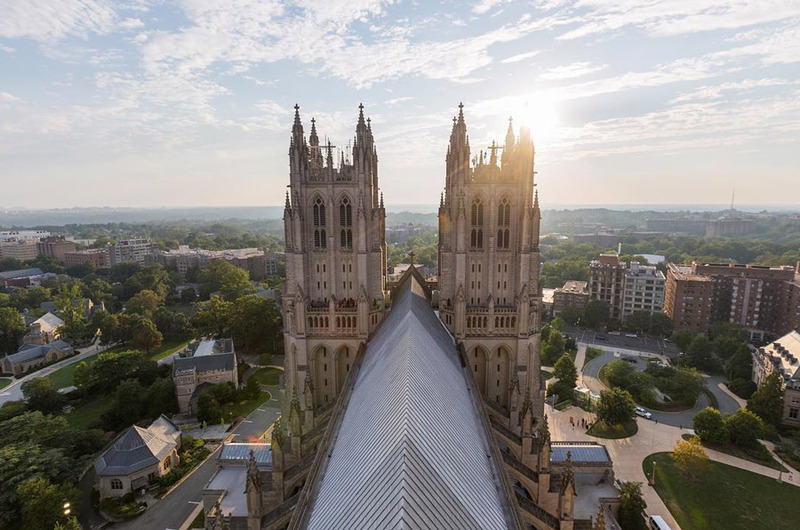 But if you want to experience perhaps the best rooftop view in the city (located on a hill, the cathedral claims the highest point in DC), you’ll want to book the Tower Climb tour. The guided tour has you climbing 333 steps to the cathedral’s central tower. Along the way, you’ll see stunning stained glass, get up close and personal with the cathedral’s famed gargoyles and conclude with a breathtaking view of the city below. Want to visit the White House without having to actually be signed in? Then head to the W Hotel. The swank hotel’s rooftop bar and lounge, POV, overlooks the White House and is favored by DC’s see-and-be-seen set. The view of the Washington Monument isn’t too shabby either. Bottle service is available at this DC hot spot and you’ll want to dress to impress if you head there for cocktails. 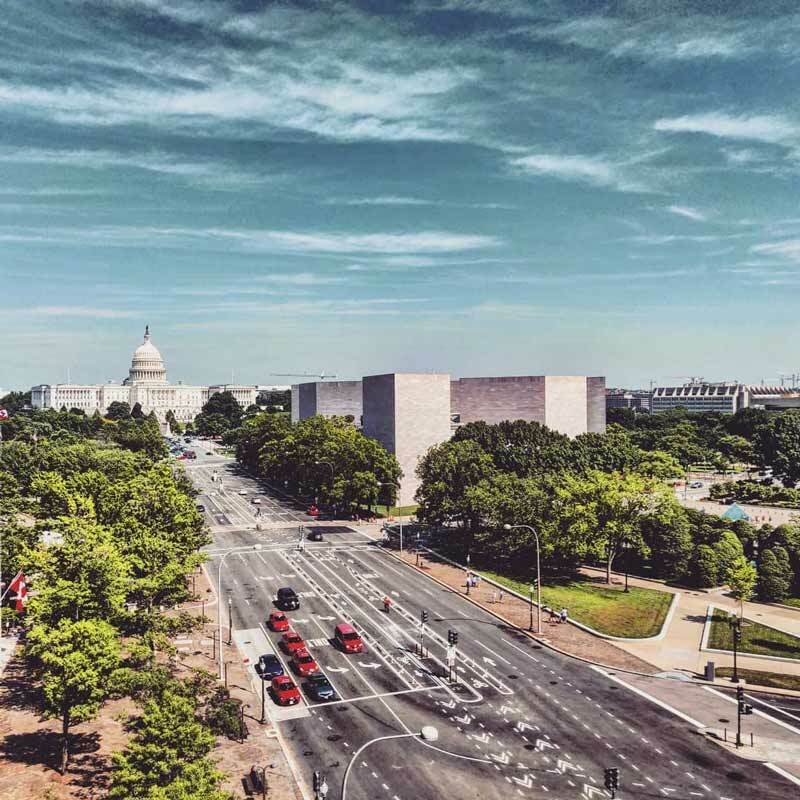 Head to the sixth floor of this interactive museum dedicated to the First Amendment for a panoramic view of Pennsylvania Avenue that’s rivaled by few locations in the nation’s capital. The museum's Hank Greenspun Terrace also features a permanent 80-foot-long exhibit detailing the rich history of one of the most famous avenues in America. One thing that never gets old to Washingtonians: a window seat when flying into or out of Reagan National Airport, one of three airports that serve the District. DCA is located just across the Potomac River in Virginia and the flight path often includes simply stunning views of the DC landscape. Before taking off, utter ye old Irish blessing, “May the wind blow from the north for amazing views henceforth.” Try for a seat on the left side when you’re arriving and the right side when leaving town for a photo op you can’t get from any rooftop in the city. Want to add food and drink with your view? Check out the top rooftop bars and restaurants. Otherwise, now that you have the lay of the land, experience the city on a tour or discover the neighborhoods of Washington, DC.